Find everything you need to know on this page to stay updated with Kenya news. Kenya has some excellent newspapers which also publish a substantial part of their articles on the internet. 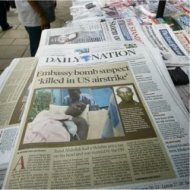 The Daily Nation newspaper is generally seen as the leading quality newspaper, not only of Kenya, but of the whole of East Africa. More about Kenya newspapers here. Kenya also has some good tv stations. The oldest station is the government-owned Kenya Broadcasting Corporation. Click here for an overview of tv stations in Kenya. Some of them can also be watched through the internet. The Kenya Union of Journalists (KUJ) defends the interests of Kenyan journalists, both their interests as workers and freedom of the press. The Kenyan media includes more than 90FM stations, more than 15 TV stattions, and an unconfirmed number of print newspapers and magazines. Publications are mainly in English, as it is the primary language of communication. The regime of Daniel arap Moi (1978-2002) held a tight grip on the media. The major tv and radio channels were government-owned, and were mouthpieces of the regime. 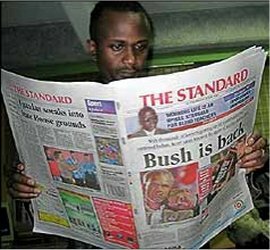 However, much of the print media – the Daily Nation and The Standard – were privately owned and were harder to control. Members of the Moi regime would make regular phone calls to the newspapers with threats if the editors would not adhere to the government’s line. Since the Kibaki government, the media have gained a lot of freedom, which they are using fully. Compared to other African countries, Kenya has a vibrant media sector and newspapers such as the Daily Nation are an inspiration to journalists throughout Africa. President Uhuru Kenyatta on the other hand, has had his fair share of media tragedy. From lashing out at the media, to him urging the Kenyan members of parliament to review a controversial bill that would sought to muzzle the media. He has tried to champion the spirit of free speech in the media. There are also worries, among others about the consequences of media concentration. A few media companies own the bulk of the media. For example, the Nation Media Group owns the Nation TV channel, the radio station Nation FM, the Daily Nation newspaper, the Business Daily newspaper, the Taifa Leo newspaper, the weekly East African and What’s On magazine. It’s main competitor, the Standard Group, owns the Standard newspaper and the major tv channel KTN. The government-owned Kenya Broadcasting Corporation runs the bulk of the other important tv and radio channels. From the perspective of these media organisations, media concentration is logical. They can adapt the same content (e.g. news) to various media outlets, which reduces costs, and they provide a one-stop shop for advertisers. But for the citizens it would be better if media ownership is as diverse as possible.